Rosenblum & Reisman is pleased to announce the addition of Adam Lazarov to our team. In the time since Adam graduated from Harvard Law School, he has gained a wealth of experience and knowledge. Adam began his legal career as an associate attorney in the international law firm, Goodwin Procter LLP in Boston. Upon moving home to Memphis, he joined Kelman-Lazarov, Inc. before going to work as a law clerk for United States Magistrate Judge Tu M. Pham. During his 18 months as a federal court law clerk, Adam gained invaluable, intensive exposure to the judiciary and to the practice of law in this community. Adam’s diverse background will be an asset to our firm as he is integrated into our cases in support of our clients. Adam’s ability to deliver compassionate representation to a wide variety of clients across a wide variety of fields is one of his biggest strengths, and this meshes perfectly with our firm’s commitment to providing superior representation to our clients. 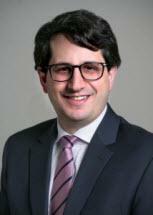 In the community, Adam serves as a presidential appointment to the board of directors of Bornblum Jewish Community School, and he is an alumnus of the inaugural Kay Usdan Saslawsky Institute for Ethical Leadership. In addition to Harvard Law School, he is a graduate of the University of Texas at Austin and Memphis University School. Adam is married to Jami Lazarov. Together they have a one-year-old daughter, Sonia, and another daughter on the way.